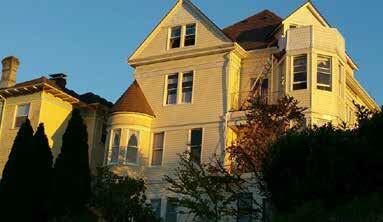 Sometimes called “Little San Francisco” because of its steep hills dotted with Victorian mansions, Astoria offers fascinating history interspersed with great restaurants, breweries, and art galleries. 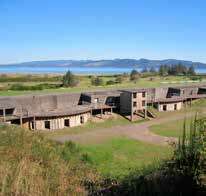 POP QUIZ: WHAT’S the oldest American settlement west of the Rockies? San Francisco? Wrong. Seattle? Nope. Portland? Wrong again. 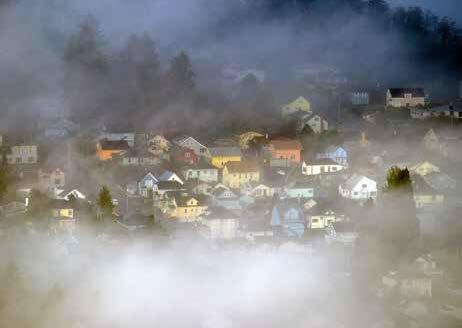 The city that claims that distinction is Astoria, founded in 1811 by emissaries of fur trading tycoon John Jacob Astor. 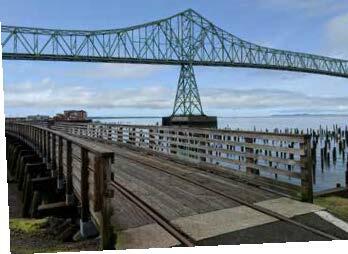 Situated at the mouth of the Columbia River, Astoria transitioned to a bustling seaport by the early 20th century, and soon became a center for processing fish, with about 30 canneries located along the river in the 1940s. 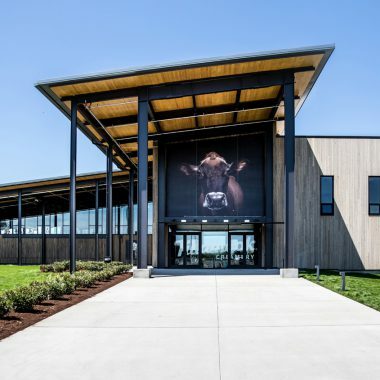 The canneries are gone, but Astoria’s rich history remains, and visitors are treated to an architecturally stunning, history-laden, must-visit Oregon treasure. I love Astoria. 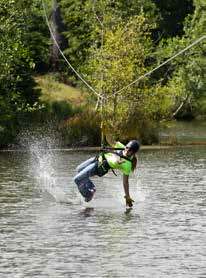 So I was elated when I received an assignment to spend a weekend absorbing the best amenities of this cherished town. My husband and I roll in around 5 p.m. and locate our home away from home, the Grandview Bed and Breakfast. Grandview’s proprietor, Loretta Maxwell, greets us like old friends. We are staying in the Gazebo. “It’s a fun room,” says Maxwell. She’s right. There’s a canopied queen bed, antiques galore, and a sweet little sitting room with bay windows over-looking the town and the Columbia. When you opt for a place like the Grandview—built in 1895 and a fine example of the Victorian architecture that Astoria is famous for—your accommodations become part of your travel experience. The breakfast room at the Grandview. After settling into our digs, it’s time for dinner. Maxwell recommends Mai Tong Thai, a relatively new addition to a small pod of food carts called Astoria Station at 13th and Duane Streets. It’s about a 10-minute walk from the B&B. Here’s the thing about Astoria: This is a town that must be walked to be thoroughly experienced. From nearly every vantage point you’ll be rewarded with a view of the river on one side and delightful Victorian architecture on the other. Fortunately for us tourists, it’s immensely walkable—no destination mentioned in this article is more than a 25-minute trek from our B&B. At Astoria Station we discover Reveille Ciderworks and meet bartender/owner Jeremy Towsey-French, who offers generous samples and descriptions of each cider variety. With our curated aperitif in hand, we order Thai fried rice and egg rolls and enjoy the food cart ambience. Back in our B&B room, we have a front row seat as the skies darken and the city lights blink on. I generally wake up early—it’s a curse and a blessing. On this day, it’s decidedly the latter. I meander down to Blue Scorcher, a 5-minute walk. This worker-owned cooperative is one of the grooviest bakery/espresso spots on the planet. Organic, locally sourced ingredients and a commitment to pay employees livable wages make Blue Scorcher a simpatico spot for your first caffeine jolt of the day. The meal is served in Grandview’s “bullet turret”—so named because, from the outside, it does indeed resemble a bullet notched onto the house. 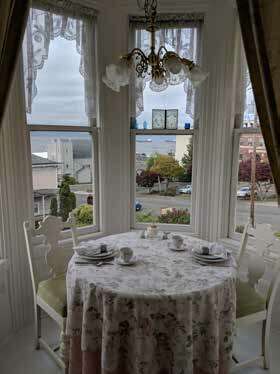 The turret’s picture windows deliver in spades with sweeping vistas of the waterfront and the Columbia. It’s our Museum Morning, our strategy being to learn a bit about the town before venturing out to sightsee. 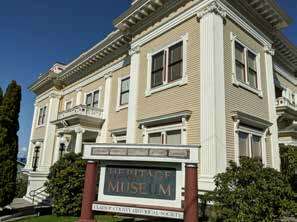 We head first to the Heritage Museum for a general education on all-things-Astorian. Chronologically, the driving factors in the city’s development were beaver furs (in demand due to the dapper top hats that were all the rage in Europe), lumber, and fishing. 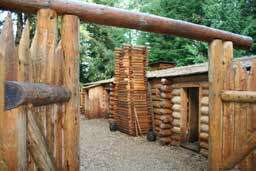 By the mid-1800s, the fur trade business had tapered off and the focus turned to lumber and salmon. In the early 1900s, more than 2,000 gillnetting boats plied the Columbia and the town boasted the largest cannery in the world. The area’s seemingly limitless supply of lumber was used to build Astoria’s downtown area on pilings. That wood became tinder when a devastating fire swept through the city in 1922, destroying more than 30 downtown blocks. 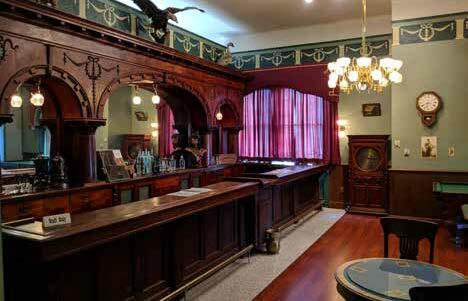 The historic downtown that we see today is the result of the 1920s restoration. 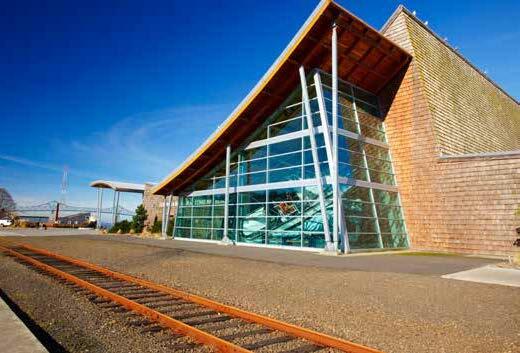 To delve deeper into the region’s co-existence with the Mighty Columbia, we turn to the Columbia River Maritime Museum (CRMM). 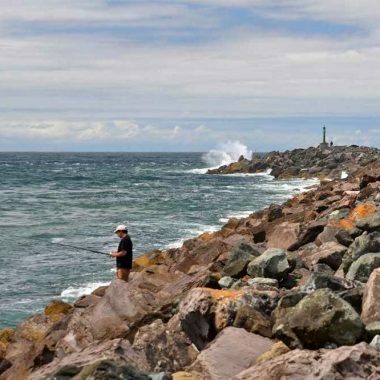 It’s an eye-opener to learn just how dangerous it is to cross the bar at the river’s mouth, nicknamed “The Graveyard of the Pacific.” The Columbia River Bar has claimed more than 700 lives and 2,000 vessels. In the Science of Storms exhibit, visitors can view the Earth from space, experience hurricane force winds in a simulator, and try their hand at giving a weather forecast. We do our best impressions of Phil the Weatherman in Groundhog Day. 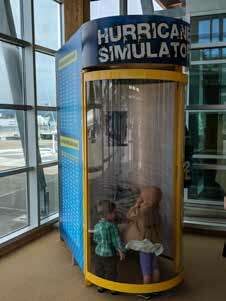 We hear continuous laughter from this exhibit as we continue through the museum’s many offerings. There’s a Riverfront Trolley stop right outside CRMM. 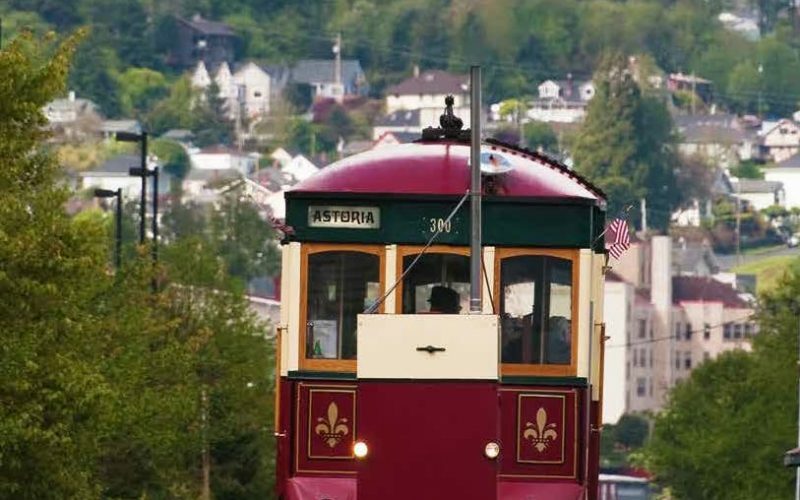 The restored 1913 streetcar runs parallel to Astoria’s delightful Riverwalk, a paved, multi-purpose path that stretches for 5 miles along the waterfront. 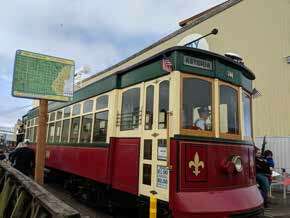 For a (literal) change of pace, we take the trolley to our next museum, Flavel House. Captain George Flavel started his career as a bar pilot and eventually became Astoria’s wealthiest man. 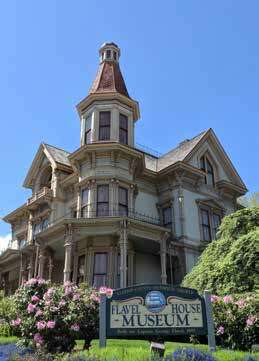 He had the stunning Flavel House constructed in 1885 and retired there. Flavel’s great-granddaughter, Patricia, generously donated the property to the city of Astoria in 1934 but the house was nearly bulldozed in 1951 to put up a parking lot (I feel a Joni Mitchell song coming on). Cooler heads prevailed. 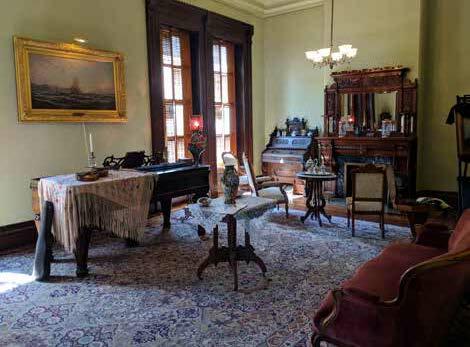 This sublime example of Queen Anne architecture—with a grand entrance hall, 14-foot high ceilings, and six ornate fireplaces—has been refurbished to exacting period standards, from its octagonal-shaped tower to its chamber pots. Being a tourist is delightful but depleting work. Time to refuel. We choose Astoria Coffee House and Bistro for our early afternoon sustenance and caffeine fix of stick-to-your-ribs clam chowder and lattes. 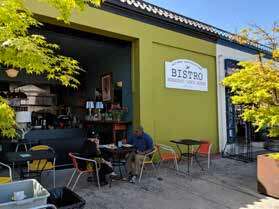 Sidewalk cafe. Sunny day. Bliss. We cap off the educational portion of our day with a stop at the Oregon Film Museum. Housed in the old county jail, this hands-on attraction offers tons of trivia about movies like The Goonies, a Spielberg film with a cult-like following, and Arnold Schwarzenegger’s Kindergarten Cop, both filmed in Astoria. 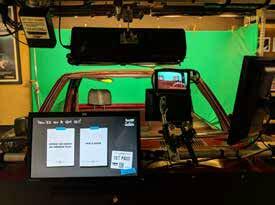 The Hot Set room allows you to produce your own movie—you can email yourself the “final cut” after making edits. Our next destination is a bit of a schlep; we cheat and take the car. 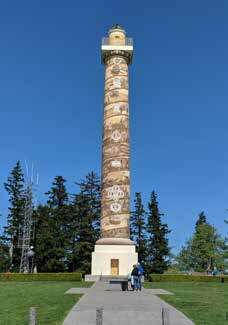 We’re heading to the Astoria Column, which is literally and figuratively the town’s crowning glory. Sitting atop Coxcomb Hill, the iconic tower is covered with murals depicting Astoria’s history. It’s free to walk the 164 spiraling steps to the top. Your reward: panoramic vistas. We watch as several climbers launch balsa gliders off the tower, an officially sanctioned activity (they’re available for purchase in the gift shop). After returning our car to the B&B, we head to Josephson’s Smokehouse, the purveyor of that delicious smoked salmon we enjoyed for breakfast, via the Riverwalk. 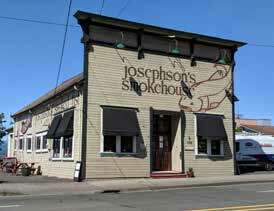 Josephson’s has been tantalizing taste buds for almost a century. We sample smoked albacore tuna and stock up on smoked salmon. The tuna is a good appetizer for our next stop: Baked Alaska, right on the river. We arrive at 5:45 p.m., just in time for Happy Hour. We opt for Passion Statement Cider (we are, apparently, going through a cider phase) and split a cheeseburger and pizza. Our tab—for food, cider, and waterfront view—is only $21. We stroll back along the Riverwalk and then cut up to Reveille for a nightcap. After another tasty breakfast, it’s time to say goodbye to our hospitable hostess. We’re off to do some window shopping downtown. A stroll down Commercial Street reveals that Astoria’s main drag lives up to its name—its eclectic assortment of businesses make the browsing (and buying) a delight. 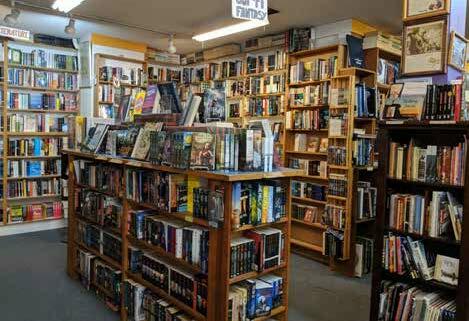 If I lived in Astoria I would be a regular at Godfather’s Books and Espresso. It’s a mini-Powell’s, with new and used books displayed alongside each other. I love that the book genres are identified with Scrabble tiles! 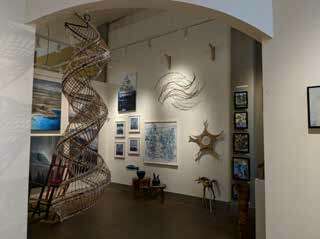 RiverSea Gallery showcases dazzling artwork, primarily from Northwest artists. 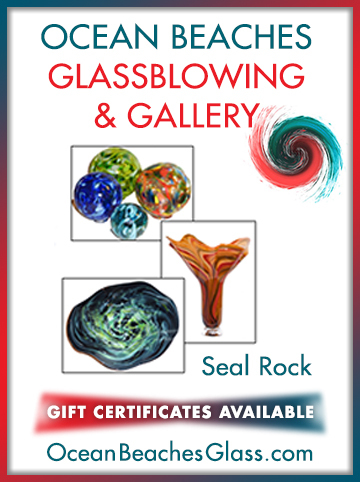 At Luminari Arts, you’ll also find stationery, scarves, socks, souvenirs, and odds and ends galore. I like this approach—if you can’t afford a $500 landscape you can surely part with a few bucks for a greeting card. We stop in at The Cellar on 10th, which has been highly recommended. 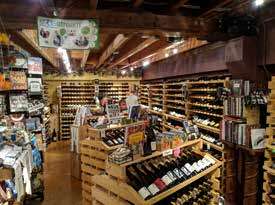 It is chock full of hundreds of bottles of wine as well as every wine accompaniment imaginable, from corkscrews to cookbooks. We enjoy a flight of wines, expertly poured by Steven Meyer. While we sniff, swirl, and sip, Meyer, a veritable Astoria encyclopedia, tells us about the varieties we’re tasting—and about his beloved city. He points out that this town of 10,000 has its own ballet company and symphony. 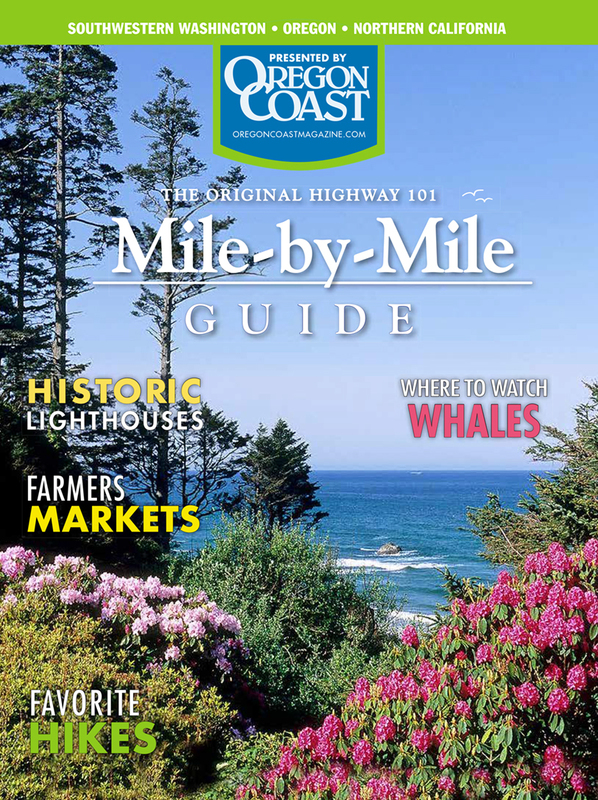 He raves about the town’s eclectic festivals, from the Regatta to the FisherPoets Gathering to Goonies Day. He’s also a huge fan of Astoria’s Sunday Market (open Mother’s Day through mid-October). While Astoria’s amenities may keep you plenty busy on a 48-hour visit, consider these options a short drive from town.